Two Certified Master Inspectors on each Inspection ! Why two Inspectors on each inspection. Different types of building and structure Inspections we offer. What is Radon and why test for it? Home › Different types of building and structure Inspections we offer. Log and Timberframe homes really do take a different mindset to inspect. Although they themselves have completely different construction and assembly methods, they share having uncommon building techniques compared to standard wood frame construction. Contractors and Tradesmen who do quality work on homes like this one are few and far between. Interestingly, from very early days Log Homes have traditionally been built by the homeowner / builder. 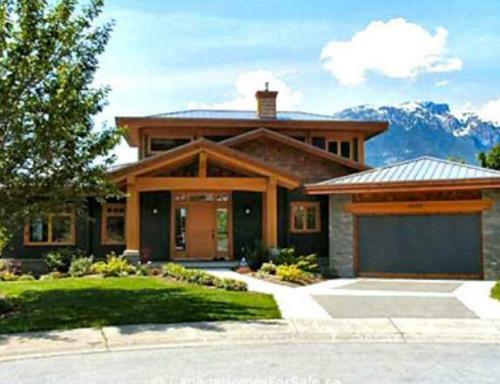 Timberframe style homes also have many owner/ builders. I remember very well my first encounter with a SSP (Stress Skin Panel) timberframe construction project. It was a small home, by today's standards, about 2100 sq ft with a large loft near Kitchener Waterloo back in the mid 70s. The son of a local farmer and grandson of a barn builder were putting it up with his dad and granddads help. I got involved as part time help and it was a very interesting project as much for granddads old fashion ways of building the bents as for his grandsons insistence on sizing and spacing them to suit the panel sizes for openings he had designed. There were some differences between the three men but they built a beautiful home together marrying the old and new. That was the first of three Timberframe homes I worked on over the years. One about the same size and one a barn conversion where the owner sold the barn, it was dismantled, moved, and the bents re-sized and reassembled to build a still very large home. I worked on the trim out and finishing of that home. There is a relativity small number of craftsmen who build Timberframe homes today. 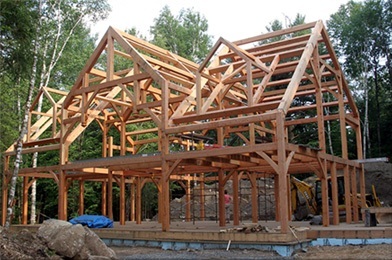 There are contractors around Muskoka, Gravenhurst, and Orillia who have varying degrees of ability and are now building Timberframe homes for customers. There are also several dozen companies manufacturing Timberframe Kits for owners to build themselves. I don't believe I have ever seen one that didn't look wonderful. Some are just very special. However, a home inspector needs to see the individual elements not just the overall picture. It can be very difficult to educate the eye to discern what you are looking at as opposed to what you are seeing in general. Its like walking into the palace of the Czars, who the heck is going to notice the capitol on the third column, left hand side, is cracked? As a home inspector with some background in the assembly erecting and finishing out of these homes I bring a unique perspective to the Inspection. 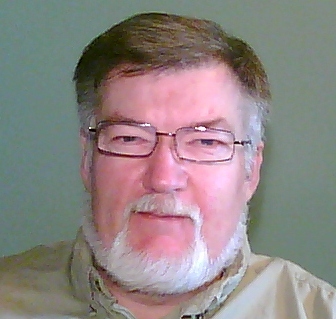 My experience and training in standard home construction and inspection is applicable to all the home systems as well. You will not get a more thorough, educated, and experienced home inspection on your Timberframe home. 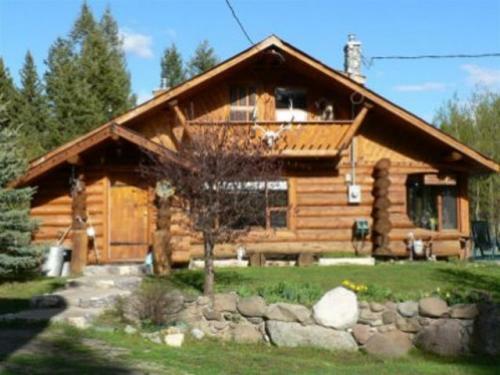 Log homes may seem a different sort of beast from Timberframe homes though, and indeed in many ways they are. They also share many aspects a home inspector need be concerned with. Highest on the list is exposure of structural members to the elements. How does that affect the individual members? What is the shape of the section exposed to the elements? Will it trap or hold moisture? Has it a round log shape that may hold moisture against the chinking / caulking causing seepage into the core of the log. Do cracks cross the log diagonally leading down or upwards?. Sawn log homes may have square edges perfect for holding moisture if the walls are exposed to driven rain or snow. 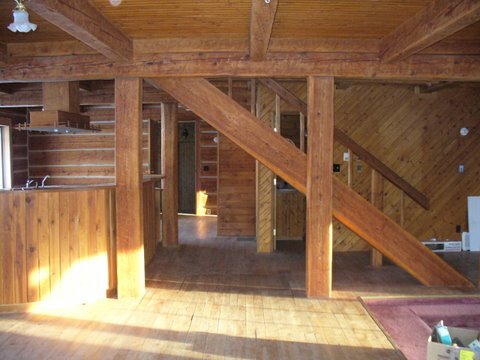 This is just the tip of the iceberg when it comes to inspecting log homes. While involved in a personal project one year I took employment in a log home manufacturing plant nearby. I got to see many manufactured log homes from conception to finished product. How they went together, what quality and workmanship owner builders and contractors put into them, and where and how things went wrong. Just as important from an inspection standpoint is how do things get fixed when they do go wrong. The question arises, where and what is compromised. Structure is the main concern yet I found it is also usually the main concern of the builder. I found that fit, proper sealing, and log protection, were the areas most often sacrificed to structural integrity. Design too took a toll on the more practical aspects of log home building. I still shake my head at the builder who put a large cantilevered balcony off the main floor dining room on a two story home. The balcony was six feet above the grade and four feet out, with no roof over it. Just a little thought would have recognized the potental for rot from snow and rain. 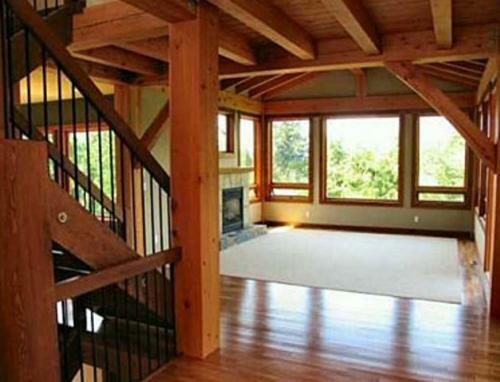 Log and timberframe homes can be strikingly beautiful and often are, but a Home Inspector has to see past that. 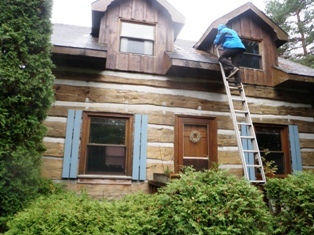 It takes a whole different approach when looking at the home to inspect Log and Timberframe Homes properly. I bring the experience and education to do a thorough and informed Home Inspection on these types of homes. Home Inspection from Barrie through Hawkestone, Orillia, Gravenhurst, Bracebridge, Port Carling, Bala and throughout Muskoka District. East to West from Haliburton, Dorset, through to Coldwater and Midland areas.